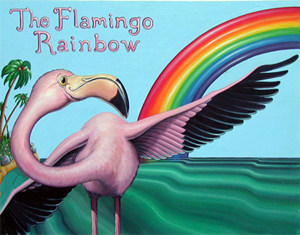 Children's Book Art, Children's Book Illustration - The Flamingo Rainbow cover illustration by Gina Harman. This is the cover for a childrens story written by my wife Gina and I. The story is about a flamingo that desides to go against nature and try something different instead of the same old diet of shrimp for what they get their bright pink plummage. Soon the flock follows and creates a variety of color within it. The last line of the story reads "Yellow pink purple and blue the flock looked like a rainbow when they flew". Children's Book Illustrations - Mouranga was a children's book set to be published by a children's book publisher out of California. The publisher contacted artist Chris Harman to illustrate the book. 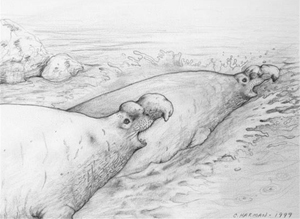 Chris did many Elephant Seal sketch studies and research upon taking on the project. He completed a full illustrated storyboard and the final full sized sketches and started to lay down paint when he got the news from the projects art director that the book was put on hold indefinitly. So, put an end to the artists first published works in childrens book illustration. To see more Mouranga illustrations click on MORE INFO. Velvet Green Children's Book Illustrations : Pond Friends - Childrens Book Illustrations featuring Billy - a tadpole that grows up into a bullfrog. This story along with all of the children's book illustrations, story board, and text were all copyrighted in 1994 by Chris and Gina Harman. This story was sent to various publishers, magazines, and galleries back in 1994 to 1998 and was then tabled to for self-publishing at a later date. In our story, Billy is born in a big pond and meets new friends. 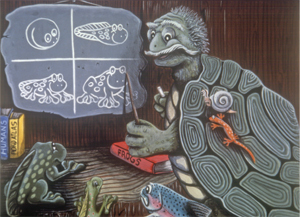 In time, he changes and grows learning from Old Timelss (the wise turtle who resides in his "sunken tree trunk home". 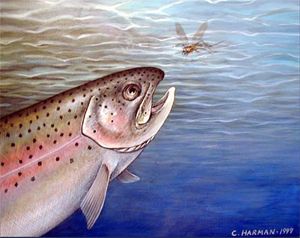 Trout and May Fly by Chris Harman is a single piece of art painted on illustration board just as a fun piece to pass the time. It was finished in one day and sold to a walk-in customer the very next. I was sad to sell it since I grow attached to the many children's art characters I create. Each painting tells a story, and in this one the main character (the trout) decides to no longer eat his natural food (the May Fly); but desides to become a vegetarian thinking he will start a trend. His idea is soon ill fated as he in turn gets eaten by a bigger fish.